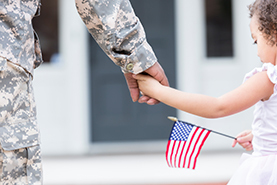 The transition back to civilian life is difficult for many veterans. Often times, military training does not directly translate to civilian skills and available jobs back home. Challenges with physical and mental health, housing, and employment are among the many adjustments awaiting the men and women who serve our country, and are magnified for veterans with service related disabilities. Addressing these challenges is the central aim of the San Diego Veterans Employment Pay for Success Initiative, Project (re)LAUNCH, a partnership of the San Diego Workforce Partnership; Third Sector Capital Partners, Inc.; 2-1-1 San Diego; and AIR. The goal of (re)Launch is to improve employment prospects and economic security for veterans with service-related disabilities. AIR assessed the availability of outcome data and is designing an evaluation of Project (re)Launch that will allow funders to measure return on investment. The evaluation will examine the impact of (re)LAUNCH occupational skills training and job placement services, coupled with case management support and wraparound services, to approximately 300 participating veterans with service-related disabilities, with the ultimate goal of improving their employment, health, and economic security.